Our new farmhouse was custom built on privately owned land within the Red River Gorge, KY. Unique features like concrete countertops, curved loft ladder, handmade tiles and black locust, cherry and walnut paneling, show the time and love given to crafting this special place for retreat and rejuvenation. A long driveway, which crosses down into a creek and is bordered by steeply wooded hills, leads to a large kitchen, sleeping for up to eight (with a fun loft!) and a screened in rooftop porch. We also offer wi-fi, a land line phone, and in the side yard there is a charcoal grill with fire ring. The confluence of Gray's and King's Branches mean a cool place to soak in the water and soothing sounds just outside the farmhouse. The large kitchen, full bathroom and small children's bedroom are located on the first floor. The second floor contains one bedroom, two sitting areas, an additional sleeping loft and screened in rooftop porch with skylights and an outdoor shower and bathtub. The structure is heated and cooled with a mini-split system and offers wi-fi and land line phone service (in our experience cell phones will work near the barn, but not very well at the house). In the side yard, there is an outdoor grill and fire ring with chairs. The well-lit kitchen is wonderful for cooking as it has a full stove, oven and refrigerator, as well as large countertop workspaces and a wood table that can seat up to eight. A custom made concrete countertop features embedded quartzite, which we harvested from the trails nearby and then polished down to a smooth, lovely, gorgey finish. The cabinets in the kitchen were handmade and planed by our good friend Donny Parker, whose woodworking skills and crafting are truly magnificent. We've said he is as much a sculptor as anything else. The cabinets contain no metal hardware, are fully dovetailed and are ash with book-matched cherry panels. The bathroom has a second concrete countertop for the vanity, which was also built from cherry lumber we harvested, milled and planned ourselves. The shower and bathtub has a window to the forest, framed in handmade tile from Seneca Tile, located in Attica, Ohio. There is also a washer available for guest use. The small downstairs bedroom has a toddler sized bed up high, accessible by a log ladder, built from ironwood we harvested from the farm. There is also a small fold out couch in this room, which converts to a twin sized bed. And, lastly, this room has a private sink, resting on a walnut slab our friend gifted us and red cedar supports, which we collected, with permission, from the state highway tree crew when a nearby grove was trimmed by the state. When we started construction in 2016, we chose to harvest two massive oak trees from the farm for the project. Much of this lumber went into key framing components for the building, but the most visible homage to their contribution is our staircase, where each thank each tread for it's daily lift. The upstairs consists of four areas: two sitting spaces, one bedroom with a queen size bed and a sleeping loft, accessed by a curved log ladder, with a full size mattress. Donny also built a lovely cherry and black locust bookcase, which doubles as the bedroom wall. 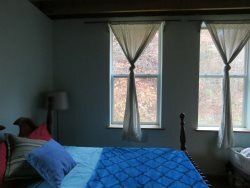 An interior window over the stairs provides ventilation for the queen size bed, and large fixed windows are at the foot of the bed, giving a fantastically beautiful view of the hillside's trees, moss and rocky features, both while awake and while lounging in bed. The upper loft is small, with enough headroom for sitting, but not standing. Perfect for older kids or nimble adults, there are two secret windows to peak out of and mixed species paneling to enjoy on the ceiling. The upstairs screened in porch faces the pasture and barn and in the winter, has a view of Raven's Rock (Raven's Rock can be seen from the field, but not the porch, when the trees are leafed out in summer). A small set of table and chairs, as well as loveseat, beckon for an outdoor meal, reading session or as an extra play area for rowdy children. There is also an outdoor shower and bathtub, featuring more Seneca tiles. Our kids love to play in the tub and watch our farm animals at the same time! Because this is a working farm, we welcome you to enjoy our ongoing projects from a safe and respectful distance, but please know we may need to access the property during your stay to care for our plants and animals. You will have complete and private access to the house. You are also welcome to walk through our farm, taking care of the animals and tools we have there. We might need to access the farm during your stay, to care for the plants and animals, but should not need to disturb you at the house for any reason. Kitchen: Full kitchen includes a gas stove and oven, full-sized refrigerator, three-basin sink, coffee pot and custom hand-crafted cabinetry. Cookware, dishware, soap and kitchen linens are also provided. Living/Dining: The main room downstairs hosts a large kitchen table fit for eight and a couch. Wander upstairs to enjoy a second living room space with hand-built shelving, a study nook and a screened outdoor porch complete with patio furniture and a bathtub! Bathroom: There is a full bathroom downstairs with a sink, toilet and tub shower. Head out onto the deck upstairs for a soak with a view! Bedroom: 2.5 bedrooms and two pull-out couches. The downstairs kid’s room has a pull-out twin couch and a twin loft. There is also a pull-out full-size couch in the main room downstairs. Upstairs you’ll find a private queen bed as well as a full bed in the loft above the second floor. Additional Amenities: Charcoal grill, heating and AC, washing machine and clothes rack, private wifi and house phone, outdoor bathtub and shower, and private fire pit.